You would expect to find aspiring authors and editors in a third-year university writing class. You might not expect some of those students to take the next step and make the aspiration a reality. Focusing Lines “Women’s Creative Nonfiction is the collection of essays complied and edited by Tracy Hurren, Sharon Nickel and Fiona Osborne, third-year students from Will Garrett-Petts and Rachael Nash’s fall 2007 English 308 class, a class that took their assignment to the next level with Service Learning. As the student editors say in the book’s introduction, the project grew from the seeds of imagination sown in class through the investigation of Mystory, a form of creative nonfiction, which combines research and personal exploration. They pitched the idea of publishing selected essays to their instructors via a follow-up Service Learning course, which they completed in May. 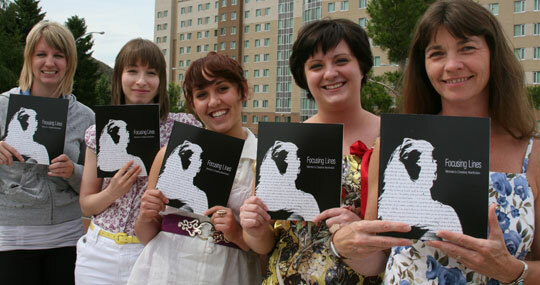 At June’s book launch, the students’ instructors noted that Focusing Lines was an ambitious project for the three students to take on as a Service Learning project. “The book does demonstrate just how flexible the Service Learning course can be, the sort of work that can be undertaken and just what students can achieve. “Service Learning can be as straight forward as working with a public service group, such as an art gallery, museum or theatre, or as creative as producing a book,” said Garrett-Petts, Chair English and Modern Languages. Often the focus of post-secondary education seems to be directed towards obtaining a credential; Service Learning provides the opportunity for a student to develop skills well beyond those acquired in the traditional classroom, laboratory and library “and to apply them in practical ways involving projects with social consequence. As well, Service Learning students further sharpen their skill-sets prior to graduation, and earn from three to six credits in the process. Describing the editing schedule as “kinda crazy,” Osborne said, “time management skills really helped get the project done and we were all conscientious of not letting each other down. Once they were given the go-ahead for the Service Learning project the editors called on their former classmates for submissions. They accepted nine Mystories for publication, and as they edited the text they worked with Mairi Budreau (Digital Art and Design Diploma 2007) on the design and layout of the book, and with current DADD student Stacey Buchanan for illustrations. Focusing Lines, published by Thompson Rivers University’s Textual Studies in Canada, is recommended reading for this year’s English 308 class and is available in Bookies for $12.99.